Of all the awards shows, the SAG Awards are the most laid back. Celebs on hand let loose, kick back with cocktails, and hang out with their friends on the carpet, at the show, and dance the night away at star-studded afterparties. As we hit the blue carpet at the 25th annual SAG Awards at the Shrine Auditorium in Los Angeles, we swooned over Angela Bassett’s sheer George Chakra plunging tiered dress (the woman does not age), Laura Harrier’s fuschia off-the-shoulder Loewe gown (she told us it gave her Barbie vibes), and got our lives when Margot Robbie worked the carpet in a plunging Chanel white and gold dress (can she be even more perfect?…we’ll wait). 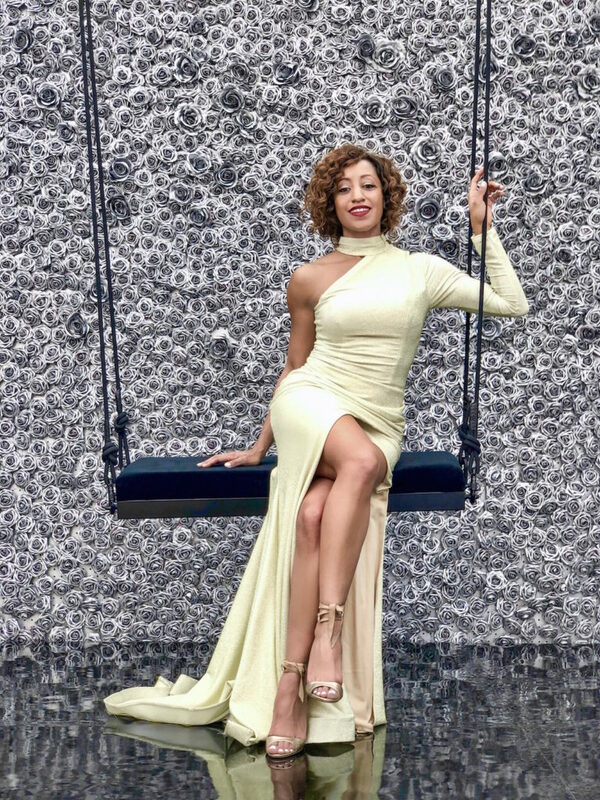 I opted for a gold one-shoulder Jessica Angel Collection gown paired with gold strappy Schutz heels. 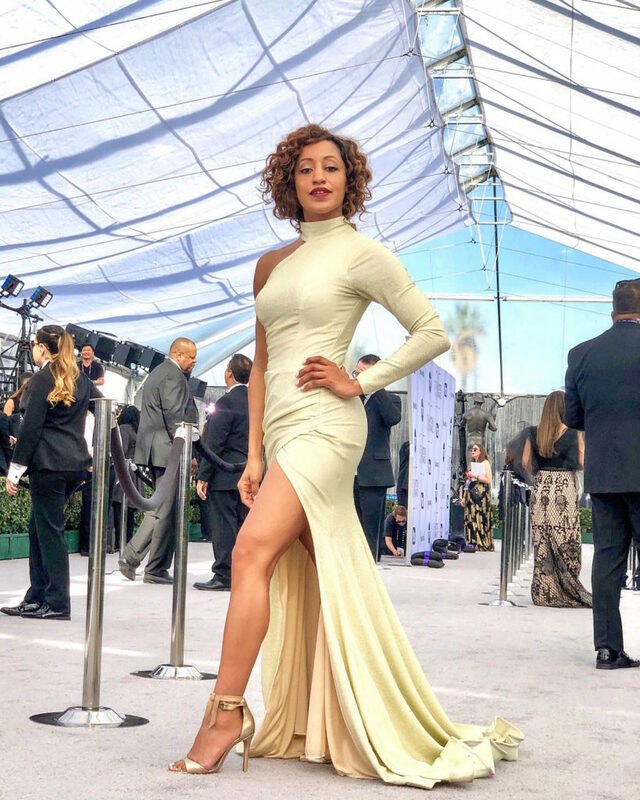 Before I started interviewing attendees, I walked down the carpet, grabbed some behind the scenes details, and hopped into TNT’s floral wall swing pop-up, where nominees and other stars grabbed the perfect photo opp. The Black Panther squad also came back to take questions. Michael B. Jordan entered the room first and slowly with a smile when he realized no one was behind him. “Oh, I’m the only one here…hi everybody,” he said with a laugh. Lupita NYong’o soon followed, and ran over and hugged him, as if they hadn’t just been sitting at the same table together at the show. Meanwhile, I was still staring at Bassett’s dress….because it was just that stunning. Then, it was time for the official People SAG Awards after party, which was just steps away from the main ballroom at the Shrine. So, what was it like to be there? I grabbed all the behind-the-scenes details just for you. 1. The Vibe: The crowd is full of industry peeps and stars, but it’s still laid back. Each cast of nominees had a section at the party complete with a booth. Black Panther had theirs, for example, as did Marvelous Mrs. Maisel, and This Is Us, among others. The casts all mix and mingle with each other, and with other attendees. No one really stays at their booth, except to rest their feet while they munch on some grub. There is a lot of photo snapping with friends, and as the party starts to get packed, people start getting loose and dancing like no one’s watching. 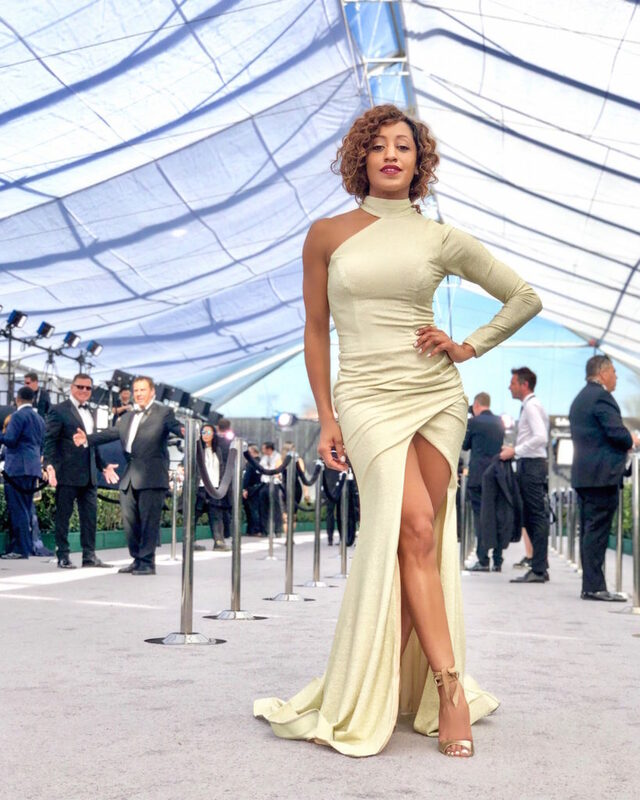 Barry star Kirby Howell Baptiste, for example, showed off her moves with friends, and twirled around her section, before sipping her glass of champagne. 2. The Standout Moments: There’s been a trend with the Black Panther squad, particularly Michael B. Jordan, Lupita NYong’o, and Danai Guerriera this awards season: they stick together, walk red carpets together, party together, and always make an entrance. The trio stuck together like glue at the after party, sipping cocktails and champagne as Lupita and Danai snapped photos and caught up with Laura Harrier, and Michael stood on a booth and shared a laugh with Crazy Rich Asians star Gemma Chan. As they all left together, two young starlets from This Is Us were having a dance party to Lauryn Hill’s “That Thing”. “Watch out! Watch out!,” someone from security suddenly yelled, stopping their dance party. He pushed people to the side while everyone wondered what was going on with all the dramatics. They got their answer soon enough as Lupita, Michael, and Danai strolled through the party and out of the door. Other standout moments? Atlanta’s LaKeith Richardson (who always gets the party started) standing up on a booth dancing with cocktail in hand, as well as Rachel Brosnahan snapping photos with friends, and Patricia Arquette hanging out with the Glow cast (including our fave Betty Gilpin) with a glass of champagne to celebrate her win. Lady Gaga and Bradley Cooper also popped into the party, but quickly filtered out. 3. What the Stars Sipped: Rachel Brosnahan, Michael B. Jordan and more toasted champagne and the signature cocktails on hand at the open bar. 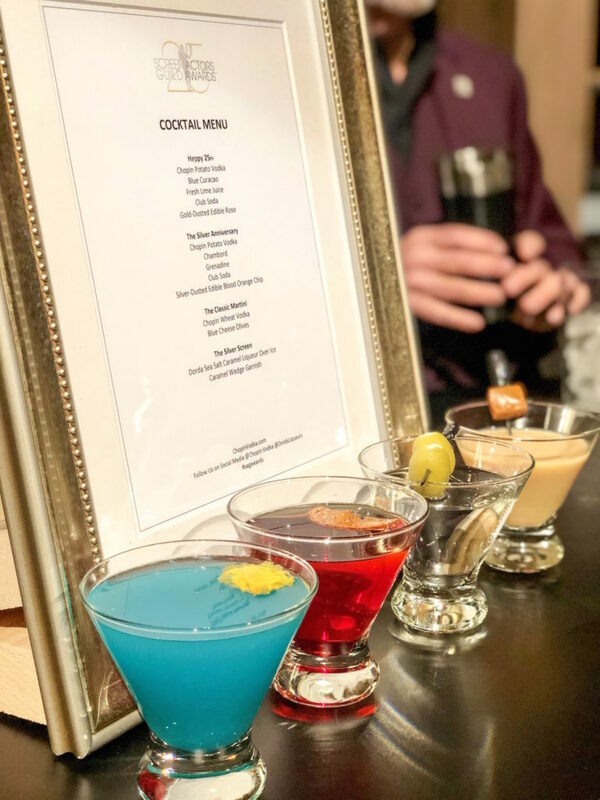 There were four cocktails on hand at the bash, and we grabbed a couple of the recipes so you can whip them up for your next awards show viewing party: The Happy 25th, The Silver Anniversary, The Classic Martini, and The Silver Screen. To whip up the Happy 25th, combine 1 ½ oz Chopin Potato Vodka, ½ oz Blue Curacao and 2 oz freshly squeezed lime juice. Top with club soda and a gold dusted Edible Rose (substitute that for the garnish of your choice). For the Silver Screen, pour 1 ½ Dorda Sea Salt Caramel Liqueur over ice and garnish with a caramel wedge Garnish. For the Silver Anniversary, combine Chopin Potato Vodka, with Chambord and grenadine. Top with club soda and a sliver dusted edible blood orange chip (substitute that for a blood orange, or your choice or garnish). 4. The Grub: Everybody is starving after the SAG Awards, so there’s usually a mad dash for the food on hand…and it’s always really good. This time around there were several food stations stacked with vegetable paella, chimichurri steak, sea bass and roasted chicken, and an ice bar topped with lobster claws and shrimp. 5. The Freebies: Everyone who attended the show left with a gift bag full of goodies (here’s my post about it on InStyle), which included Bombas socks (the most comfy socks ever), foot spray for stiletto wearers, retractable earbuds, cell phone accessories, L’Oreal beauty products, LED party lights and more. All party goers were all privy to free glam touch ups at L’Oreal makeup and hair stations, as well as free L’Oreal mascara and lipsticks, and the most clutch item of the night – a fresh pair of gold or black Rollasoles rollable flats from the free Rollasole vending machines on hand. Stay tuned for more awards season coverage!